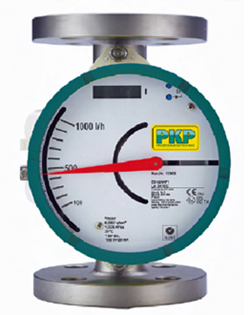 The Float Type Flow Meter Model DS25 work according to the proven variable area principle.The float is guided in a conical measuring tube and is nearly independent of the viscosity of the medium. The flowing medium moves the float in the flow direction. An externally mounted pointer indicator is magnetically coupled to the float and thus, following the float position, indicates the flow rate on a scale.This indicator assembly is equipped with a scale calibrated to the operating conditions in the system and additionally may contain alarm contacts or an an analog output. The variable area flow meter model DS25 is used for measuring and monitoring the flow of all kinds of liquids or gases. By using only stainless steel 1,4571 for the wetted parts, the meter is especially suited for aggressive media or for use in food and drink applications (with Tri-Clamp or other hygienic process connections).